Before we get to the above, let’s talk about love, shall we? Love is…being at critical mass of dessert in your fridge (when you’re not a particularly big dessert person) and making yet another dessert because that dessert is needed. That is love my friends. I love you all. If you love me back, I know you’ll understand the fact that next week there will be NO dessert offerings on Bariatric Foodie. I think once the divas get back the situation in the fridge will work out but until then…yeah. NEWBIES! Hi. I’m Nikki. If you’ve never been here before, this blog is all about post-op yumminess. That doesn’t stop during Easter. Now I know what some of you probably thought when I said I’d have a newbie-friendly Easter offering. You thought I was going to suggest some sort of egg salad concoction, didn’t you? In a blender or food processor, combine everything and pulse until smooth. The cottage cheese curds should no longer be visible. 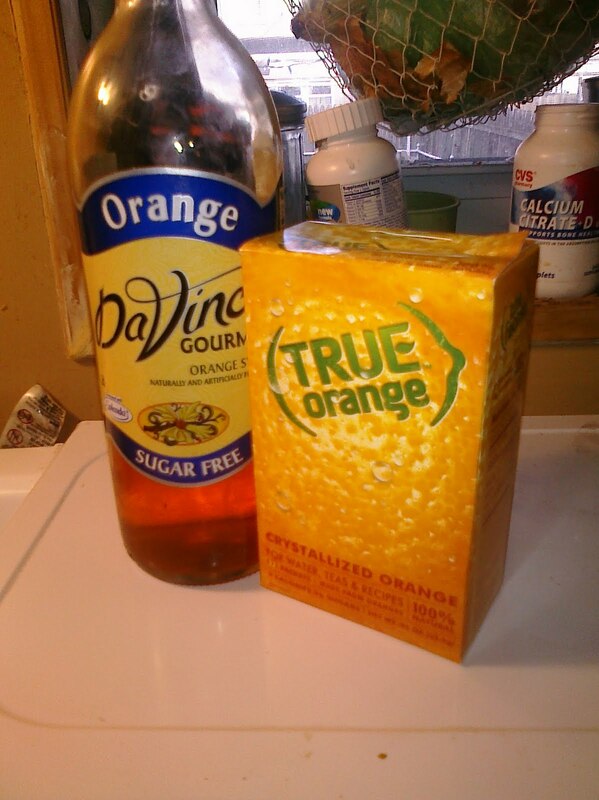 If you don’t have the Davinci sugar-free Orange syrup…no worries! I use it mostly to achieve an orange-ish color (and as you can see that didn’t work out so well for me). The same can be achieved (if you so desire) by using food coloring. True Orange. It’s in the sugar aisle of your grocery store. You’ve walked past it a thousand times. I guarantee it. It’s even near the Splenda. You can use butter extract, if you have it, instead of butter spray but do use one of the two. TIP: butter is what makes the cream fillings in Twinkies, cupcakes, etc. taste the way it does. If you want a traditional cream egg, omit the orange stuff. If you want a coconut cream egg, add coconut extract or syrup. Play around with it. It’s your recipe!!! I personally would have added a shot of Butter Rum syrup if it were just for me to make it a little more grown-up. Sugar-free chocolate chips: I can’t speak for yours, but my Wal-Mart sells them. Hershey’s. I used mini-sugar free chocolate chips I bought on Netrition. For some reason my linking is wonky on Blogger today but if you use the handy search box on the right menu bar, search “Senseo sugar free chocolate chips.” All will be revealed. I am not a big sweets fan but love these eggs. I'm going to be whipping this bad boy up on Sunday, thanks! I just ,made this with Chocolate Pure Protein and Raspberry Syrup-then FROZE IT! Hella-Yum! and my version has 38gm protein (are you kidding me!) and only 12carbs. very filling!